There is no substitute for real lessons one on one but if that’s not practical for you for any reason there are other options. From as little as $15.00 per lesson you can do a correspondence tailor made drum course from the comfort of your own home! Or have a one on one live Skype video lesson! We will have a chat,either by email,phone or Skype to discuss where you are with your drumming and assess what your strengths and weaknesses are. Then I will prepare your lesson for you based on what we think you need to work on. You can choose either a live online skype lesson,a pre prepared worksheet and audio clip lesson or an extended pre prepared lesson with video clip examples. I’ll email you sheet music in pdf format and audio examples played by me for you to listen to. I’ll also write performance notes on how the exercises/pieces are to be played. You can email me back with any questions or problems you might be encountering and I’ll get back to you with pointers and guidance. In the extended version short video clips can be forwarded showing the correct technique. I can also receive and listen/look at audio and video of you playing the lessons and give you feedback. It’s really useful if you can do this, it’s pretty simple with smartphone technology available these days. When you’re ready for your next lesson just let me know, it’s best to leave it no more than 2 weeks between lessons. This will be totally different from looking at drum lessons on youtube or some other free or cut price online lesson sites as you will be getting a personalised drum lesson made just for you as you would be if you were here in my studio, not getting overloaded with information and how to videos which can be overwhelming and bad for your musical progress. You’ll be getting valuable feedback on what you’re doing which is one of the most important aspects when learning an instrument. I’ll be putting at least as much of my time in to your lessons as I would if you were here taking the lesson in person. No copy/paste and hit send, I will genuinely be on your side with getting your drumming where you’d like it to be. I get a real kick out of seeing my students succeed! I’ll also act as a mentor that you can bounce ideas off of and ask questions about anything drumming related or music business related. Over the years I’ve gathered dozens of fantastic drumming tutorial books,hundreds of music scores to drum along to your favourite songs and countless exercises,grooves,solos and general drumming gold I’ll give you access to as well as my insights and experience in learning my instrument. Most importantly this information will be given to you in an organised and coherent way (unlike scanning the net for free lessons) making sure you have a strong foundation to your playing then building progressively on that to reach your musical goals. Trinity College London Rock and Pop Exams can be trained for and entered if that’s your thing. Reading music is a plus but I can teach you that too if you can’t, and the audio examples I send you will further aid those that can’t read standard drum notation. Why buy online drum lessons from me? You’ll be getting a personalised drum lesson that will help you further your drumming skills in an organised and structured way. You can learn from the comfort of your own home, no need to travel. Learn when you have time. You are not locked into paying for a weekly lesson, learn at your own pace. I genuinely want to see my students succeed and I do everything I can to help my students reach their full potential. 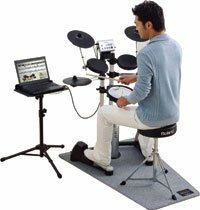 Live Skype drum lessons will be just like if you came here to my studio,only cheaper and you don’t have to leave the house! This price includes a video recording of the lesson for you to look back over. PDF worksheets and mp3 play-alongs . Please ensure you have a strong broadband connection for this.